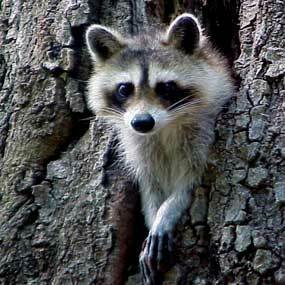 Raccoons originally resided in North American mixed and deciduous forests. They eventually dispersed to mountainous regions, coastal marshes and urban areas. Because of humans, raccoons are now also distributed across Europe, Japan and the Caucasus region. Adult Raccoons are usually 16 to 28 inches long and weigh from 8 to 20 lbs. Their gray coats are mostly underfur, which is used for insulation against the cold. Some of the raccoon’s most distinctive characteristics are its striped tail, highly dexterous front paws and black mask marking. Raccoons will eat almost anything – insects, slugs, dead animals, birds and bird eggs, as well as fruits, vegetables and seeds. Around humans, raccoons often eat garbage and pet food. They are particularly fond of aquatic creatures – clams, crayfish, frogs, fish and snails. Although not great hunters, raccoons can catch young gophers, squirrels, mice and rats. Raccoons have home ranges and maintain a steady population density based on food. In hardwood forests, this is about 15 animals per sq. mile. Natural predators of the raccoon include bobcats, lynxes, coyotes, wolves, great horned owls and eagle owls (they don’t affect Raccoons in the cities, though). Raccoons generally mate once a year from late winter through early spring. Gestation is about two months long, after which a female will give birth to 2-8 young. Female raccoons become very aggressive as they protect their young. Kits stay with their mothers until they find their own dens their first winter. There are many warnings against human interaction with raccoons. Although it is rare, it possible for Raccoons to carry rabies. Homeowners find Raccoons increasingly problematic. They raid trash cans, attics, basements and garages. Some people have raccoons as pets, but they can get easily angered after a year of age, then bite and scratch. Many expanding suburbs and habitat encroachments push these animals to live among people. City dwelling has evolved Raccoon’s brains faster than ever, more in the past 70 years than in the previous 40,000. Their long fingers enable them to open latches, untie knots, turn doorknobs and open jars. They can remember how to complete these tasks for up to three years.